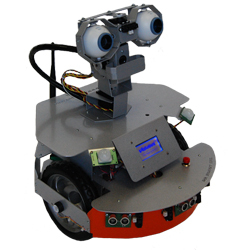 The X80-H integrates Dr Robot’s animated head system with an X80 base. It provides broader versatility for researchers and developers who like the features of the DRK-8080, but would prefer a platform whose size and power are closer to that of the X80. X80-H matches the servo and sensor specifications of the standard X80 with a few improvements. 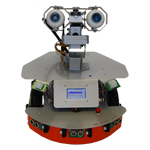 Rather than a pan-and-tilt camera, the X80-H has a five servo animatronic head with an integrated IR sensor. The microphone and speaker that are mounted on the X80 are replaced by the microphone and speaker built into the animatronic head. The LCD panel mounted on the front of the X80-H also makes it distinct from the standard X80. This display is an STN negative blue, transmissive, wide temperature LCD and supports a resolution of 128x64 pixels. Extended operating time. 3 hours nominal operation time for each recharging. Vision-landmark base indoor localization (indoor GPS, position/orientation) sensor and the landmarks together provide precise position and direction information covering every inch of the floor. 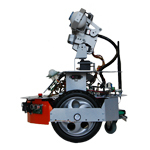 Power and battery systems for 6 hours operation time are available.